After finishing his daily walk in a nearby park in the morning, 79-year-old Ren Shuanggen, a resident of Hujialou residential complex in Beijing's Chaoyang district, puts on his red armband and does his volunteer work for the community. He begins by scrutinizing whether there are any new posters sticking on his neighbors' doors or any people throwing garbage in the corridors, and then strolls through the community, chatting with some old friends and keeping an eye out for any unusual things. Ren is one member of the "people of Chaoyang district," a name given by Net users to volunteers from communities who offer information to the local police and assist in keeping the district safe. The exact number of the group remains unclear and the public still has questions about their working routine. On May 17, an official named Mu Lin (pseudonym) from a central government department was arrested by plainclothes police for carrying drugs with him in Shuangjing. Police credited the people of Chayang district for offering information, according to the Beijing Times. This is not the first time the public have read in newspapers or social media about the people of Chaoyang district assisting the police to crack down on crimes, especially drug-related ones. The people of Chaoyang district began to gain fame on social media after being credited by the police as the source leading to the arrests of several celebrities involved in drug-related crimes since last year. As the main information source in multiple high-profile cases, Net users quipped that the "People of Chaoyang district" resemble an intelligence agency like the CIA, the KGB or Military Intelligence 6. "The people of Chaoyang district are mysterious because the police protect the privacy of our sources … they are also admirable for helping the police search for clues, and check for risks in transportation, public security or fire control. Everyone can contribute," the Beijing Public Security Bureau said on its Sina Weibo account on May 29. But to Zeng Yuanpeng, a member of the community security and comprehensive management of the sub-district administration office in the Hujialou residential complex in Chaoyang district, the people of Chaoyang district are not as mysterious as some Net users think. "They are actually residents who are enthusiastic about maintaining the security of the community, or community business owners," Zeng said. The sub-district administration office is responsible for organizing volunteers from communities and sometimes recruiting residents by paying them a small, token amount of money, for example 20 yuan ($3.22) a day, to support their work as security forces in crime prevention, said Zeng. Like Ren, most of the volunteers and paid residents are retired, and have the time and energy to help spot suspicious individuals and report unusual incidents, such as a fire, to the sub-district office, according to Zeng. Ren and his wife, Wang Ruiying, also a community volunteer, patrol the community between 9 and 11 in the morning and 2 and 4 in the afternoon. They notice strangers wandering in the neighborhood. "We stop to ask some simple questions to see if strangers need help, such as 'Who are you looking for?' or 'Are you lost?'" said Ren. Most people answer these questions out of politeness to the elderly without feeling offended, said Ren, adding, "We did this out of good intentions or just for casual conversation. Only when the strangers behave too suspiciously do the volunteers report them." "Some information gathered by volunteers in this way is very helpful in dealing with conflicts in the community, collecting clues for the police to track down suspects, and keep safety in the community," said Zeng. 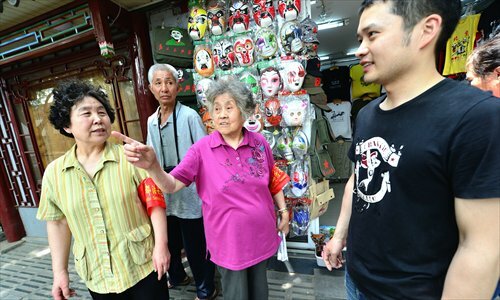 "By volunteering in public security work, these senior citizens find a way to kill time in retirement and help maintain safety in communities in Beijing," Zeng said. Information about suspicious individuals, cars and incidents is reported to the sub-district administration office and then handed to the nearby police station for the policemen to begin an investigation, a policeman from Chaoyang district who asked for anonymity told the Global Times. And sometimes the residents directly call the police to report incidents, said the policeman, adding that both ways help reduce crimes in communities. Not only have residents in Chaoyang or other districts in Beijing been mobilized into participating in crime prevention, but also residents in other places in China. Bringing more people into preventing and cracking down on crimes is a good tradition and an effective method for public security bureaus to keep public safety, Wang Dawei, a professor from the Chinese People's Public Security University, told the Global Times. The Beijing Public Security Bureau said on its Sina Weibo account on May 31 that by deploying around 1,500 people including policemen on the streets to conduct routine patrols, the number of calls to the police dropped by 59.6 percent, and the number of criminal cases in Chaoyang dropped by 28.9 percent since April. "In order to deal with the shortage of police forces, China and some Western countries usually regard the public as the main force in keeping public security," said Wang. Public security bureaus are the main force for cracking down on crimes, but without assistance from the public, they could not accomplish the work, said Wang, adding, "This is what we called 'limited police forces accompanied with unlimited manpower from the people.'" More than 600,000 people in Beijing were mobilized into keeping public safety during the annual two sessions in March, who cooperated with the police to reduce calls to the police by 42.7 percent from last year, according to people.cn. "The community is our home, and it is every resident's responsibility to keep it safe and sound," Ren said. Ten minutes before, he had reported a fire to the sub-administration office after seeing heavy smoke from a neighbor's window.